Five days after the “Event” I finally found the time – and the strenght – to write about it. During these past days I’ve been thinking about what to write and the problem was that I hardly had something to say about the game itself because my whole day has been devoted to attending the kids who were the standard-bearers during the National Anthems. So, when you find yourself with 6 children, 4 of them aged under 8, to look after in a gigantic stadium with 80.000 people attending the game, well the least you can do is to turn yourself into Father Goose, or in this case, Mother Goose… And trust me, it can be extremely weary but most of all it can be scary: the idea to lose a child in such a bedlam is frightening! Then, to this trifle, you should add the fact that the very clever event organization gave us the the seats in 2 different sectors (bloody hell!!! ), so I had to send the oldest two (2 of my Under12) to seat 50 meters apart, while the rest of us was given the worst seats ever, in the first row at ground level with huge parapets at eye level. I am 5’2 and I couldn’t see anything… so go figure what the kids could see from there too…. Anyway, busy as I was looking at the two Under 12 far away, and babysitting the youngest who kept on asking for attention, you can easily imagine that I hardly saw anything and all I got was a stiff neck! In the end I even had to give up the idea to follow the action live and watched some of it on the mega-screen… how I longed for my couch and TV set! All in all, this has been one of the most terrifying experience of my life. Sorry for the poor quality of the picture, but the aforesaid conditions undermined also my photographic skills. Perhaps you’re right… the only little piece of game that I was – more or less – able to see was the last 10 mins because the notorius longest-scrum-sequence-ever was played in our half but on the opposite corner. 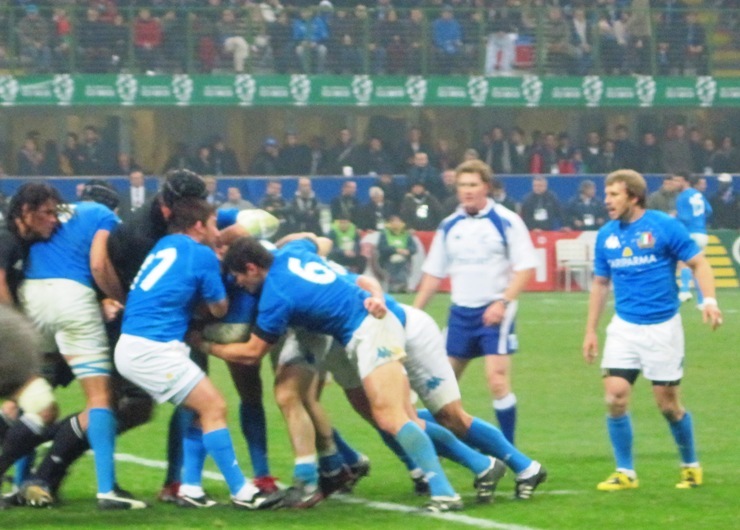 So I saw the *so called* ref pointing his arm to the Azzurri and reset the scrum again and again and again, hoping for a penalty try at last, but uselessly… and I couldn’t even express myself freely with my vast and colourful vocabulary due to the kids! !